Nigeria’s President, Muhammadu Buhari in airport has returned to Abuja from London, where he attended the 2018 Commonwealth Heads of Government Meeting, CHOGM. 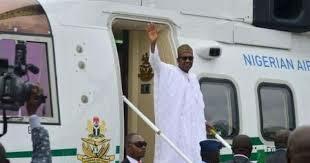 The President took off from London a little after midday on Saturday and arrived Nigeria few minutes past 7pm. He was recieved at the Nnamdi Azikiwe International Airport in Abuja by top government functionaries. 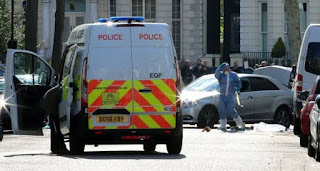 Buhari had travelled to London on April 9 shortly after declaring his intention to seek re-election at the All Progressives Congress’ National Executive Council Meeting. While attending CHOGM, the President called for more investment in Nigeria, pointing out that encouraging trade and investment are the surest way of getting millions out of poverty. He also called on Commonwealth heads of state to avoid trade warns, warning that it would hurt development efforts. Buhari had at a meeting with the British Prime Minister, Theresa May, stated that while politicians are preoccupied with the 2019 elections, he is more concerned about the security of the people and the growth of the Nigerian economy.